Yes, we remember that day. 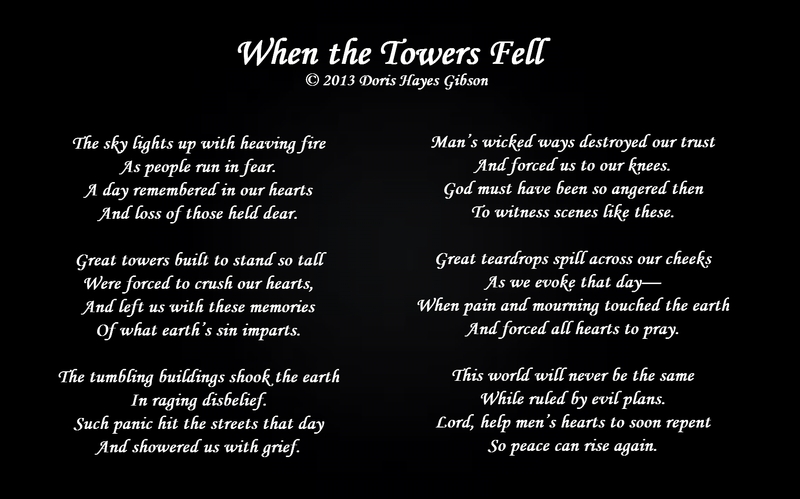 The day the towers fell. A day forever etched into our hearts. A reminder that life can be shortened and freedom can be robbed in the blink of an eye. May God help us to never forget those who paid a tremendous price while trying to help others. Innocent ones whose voices were permanently silenced that day. No chance to say goodbye to loved ones waiting for them to return home. Now they stare at that empty chair. They awake to find it wasn’t a dream. Our prayers go out to each one who lost a loved one on that unforgettable day. God feels your pain. He will hold your hand and walk with you the rest of the way home. Trust Him. My name is Doris Hayes Gibson. My life revolves around Jesus Christ, my Creator, my Redeemer, the Lord of my worship, and the Hope for my tomorrow. My passion is to illustrate God's beauty and love through poetry and song lyrics. I have created hundreds of framed poetry images. Some were gifts of encouragement; some to honor a memory of a loved one, and some were created to help someone celebrate a special occasion. After living out of state for several years, I am, once again, residing in the beautiful Upstate of South Carolina. I have three grown children, five grandchildren, and a blue tortoiseshell Burmese cat. Illustrating God's beauty and love through words of poetry is my deepest passion. Although I have always enjoyed writing, it wasn't until 2005 (when God shut one door) that I realized He was opening the door of a tremendous opportunity to see Him use me in a spectacular way. While I do not claim any greatness of ability in any shape or form, I do know that God brought me through many trials and heartaches for such a time as this. I am now able to share this gift of poetry, with which He has blessed me, to magnify Him through blessing others. I Peter 4:10,11 states: "Each one should use whatever gift he has received to serve others, faithfully administering God's grace in its various forms. If anyone speaks, he should do it as one speaking the very words of God. If anyone serves, he should do it with the strength God provides, so that in all things God may be praised through Jesus Christ. To him be the glory and the power for ever and ever. Amen." Through my writings, my main goal is to edify Christ. If I have touched one person in a positive way through this ministry, I know it will be worth every effort I put into my work. As I have said before, "This is My Labor of Love...but God's Work of Art." My first book, Heart Written - Breaking Free, was published in November of 2012. It is my prayer that it will reach countless souls and bless lives in tremendous ways. In 2014, my second book, Heart Written - Calling Me, was published. My third and fourth books, Heart Written - Cleansing River and Heart Written - Guarded Treasures, are now available. Please visit any online bookstore to purchase my books or contact me for your personally signed copies of my Heart Written series. This entry was posted in Freedom, Never Forget, Remember and tagged 9/11, Death, destruction, Falling, Fighting for Freedom, Fire, Freedom, Horror, Loss, Loved Ones, Never Forget, Pain, Tears, Terror, Twin Towers, Weary, World. Bookmark the permalink.